Here are some videos from today's visit with the bees. 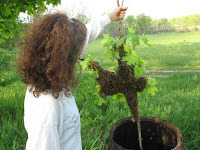 We have a later swarm season this year due to the many cold spells. 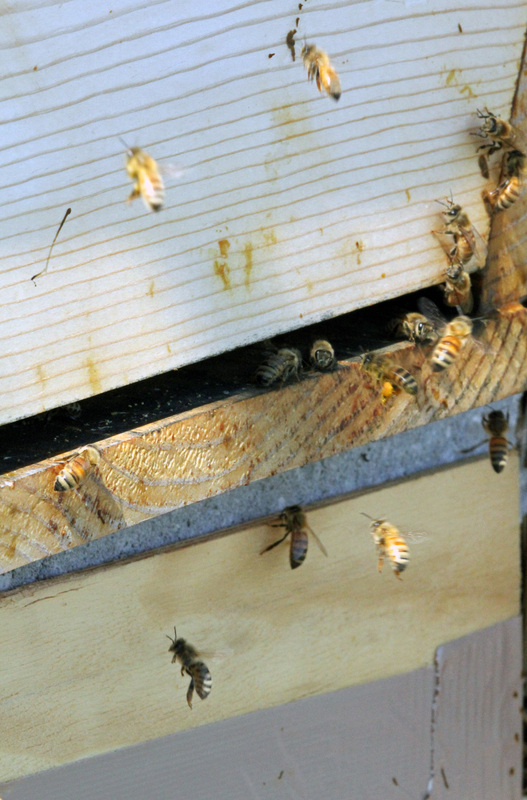 Some hives have already swarmed according to local beekeepers, but the main season is expected over the next two weeks. I was very excited to see a good-sized cluster of bees in the hive, that they made it through the winter, and that they seemed to have plenty of honey left for the remainder of the cold season! I had brought some honey to feed them, but upon inspection realized they didn't need it! Also, a wonderful view of the fresh uncapped honey cells.. notice how the cells are built at a slight upward angle - so the honey doesn't run out! Taking off, and coming in for landing at the hive entrance. Fun to watch! The honey bees have been in cluster - where all the bees huddle together around the queen and "shiver" their bodies to generate warmth - keeping the group around 94 degrees regardless of outside temperature. To maintain this winter activity they feed on their honey stores collected from the warm seasons. Generally the huddle keeps moving as a group to the next area of stored honey in the hive, and this is easier when they just need to keep moving upward. But it becomes more difficult when they actually have to go back "down and around" to get to the next hanging section of comb - especially when its very cold - they cannot break from the tight cluster without losing too much valuable body heat. Here in Michigan we've had a week of very cold, single digit temperatures and another week of cold in the forecast. Although the bees may have enough honey stored from a very full warm season, it may be hard for them to reach the honey stores in the hanging combs. 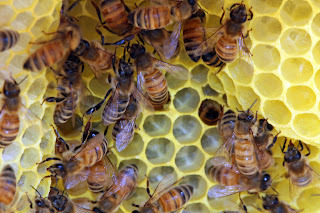 To do this they either need to move as a group to the next honey-filled comb or break out of the group cluster individually to seek out the honey stores. And right now it is too cold to do that - individually. Group intention or prayer can be very powerful, so I thought to ask for your visions and prayers of warmth and dryness for these little beings during this time of extreme cold weather. Here are photos of each hive - maybe try visualizing or just feeling the inside being warm and dry and plentiful of honey! Hello, and colorful fall greetings to everyone! 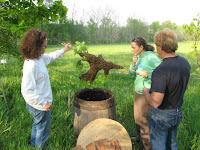 held at Grass Lake Sanctuary in Manchester, Michigan. There are some exercises during the talk that you may wish to participate in, with pen and paper at hand.. If you enjoy the presentation, please consider supporting the bees at GLS by making a donation, in any amount. Visit http://grasslakesanctuary.org and click on the Donate button. Drone Bellies - Check It Out! Hello, and summer greetings to you ! Below is a most interesting site - many drones hanging out along the observation window. Drones do not forage for food, or clean house or help with the young... they cannot sting either. They rely on the workers to feed them. Their sole purpose is to mate with the queen, just once, and then they die. Quite a role to take! They feel humble, strong and serving. Thank you drones. Below are two videos - one from the "mother hive" - the original 2011 hive, and one of the second hive, the barrel of bees - about five weeks after the big swam on Mother's day. It was laying on the floor of the hive for a week or so and I was just going to leave it - not wishing to disturb them. Then, on this day it became "clear" that it was okay for me to go in and remove it. You may notice that the cells are a little squished... not perfect hexagons, as I had to scrape and squish it a bit to get it unstuck from the floor. The dark yellow spots seen within some of the cells is uncapped nectar that appears to have solidified. This is not what it looks like in the hanging comb. honey bee girls drinking from the sanctuary pond. They take water back to the hive and use it to fan and cool their home during the hot days of summer. about midway into this video you will see a lovely bee girl moving from upper left to lower right parts of the screen. She has a mite on her left shoulder. It looks to be the size of a pin head and is light brown in color. At first I felt a sense of panic... "oh no, mites!" ... like one may react to any first sign of dis-ease. I did not include the site of the mite in my video narration - as I did not wish to create alarm. It is not pleasant watching someone you care about being "parasitised" by another. 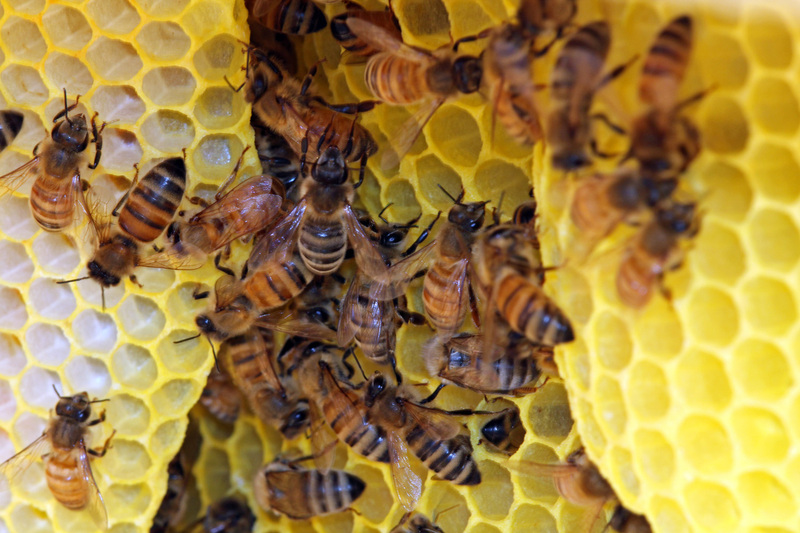 Mites in the hive can become problematic, and many bee keepers will use chemicals to treat them. But the chemicals themselves have their drawbacks, just as in the treatment of human diseases. And just as with human dis-eases, one of the best treatment approaches is with diet and building the immune system. In addition, low levels of mites, bugs etc in the system may be normal. It is when the system, or body becomes out of balance that the bugs can start to wreck havoc. I chose to watch the colony closely for any more mites. My thought was that the bees have plenty of healthy food to forage upon at the Sanctuary and hopefully this was just a stray mite, not anything to worry about. If I did continue to see more mites I would consider feeding them some bee tea recipe (idea from Spikenard Farm) with honey, and herbs to help boost their immune system. I watched throughout the summer, and in all that time only saw two other bees with mites...Not that I viewed them all... with perhaps 10,000 in the house (!) but it felt as though they were doing well, flourishing, building comb, storing pollen and nectar. yet with a relaxed "rhythm" of working with, and amongst each other. Today I appreciated more, the miracle that it was... as Sunday I was perhaps more concerned about whether the barrel would make a suitable home. Walking down the lane today and getting the first glimpse of the bees buzzing about the entrance hole in the barrel I felt so joyful, I did a happy dance there in celebration. I feel so blessed and grateful for all that they are teaching me. Here is a photo from Sunday. I was a bit shocked at the image the bees seemed to be forming in the photo - a human form. with a recap of the year. Last week I had taken a big wine barrel home to clean out. It had been sitting by the cabin near the pond since the land was purchased several years ago. I was hoping it could perhaps be turned in to a house for honey bees. I hosed it out well, and let it dry in the sun, but did not work with it otherwise. I decided to bring it back to the land with me today thinking perhaps Tim could do some work on it with a new tool he has for routing out trees. I pulled it out of my car and rolled it up close to where the bee swarm was gathering. I had a "lid" for it - a circular piece of plywood that I found in one of the scrap piles from the work that was being done on the upper cabins. "I think I'll take a walk..."
"It is, what it is, of course..." I said to myself. Joe was on his way to the land to do some work and he had an 8 foot ladder with him! "Okay - that would help". "ok...great they were there last time and that seems right..."
...came upon the scrap pile again, by the eloos...(outdoor luxury toilets) there were lots of cedar shingles in the pile... hmmmm....? "these look useful... Im not sure for what, but I'll take them back with me". "These cedar shingles can be used to raise the floor in the barrel" The bees don't like too big of a space. That was one concern with the barrel - too big and drafty. The shingles were long enough to lay horizontally across, about 3/4 of the way down, so they made for a cozier space, they also served as a ceiling - under the plywood disc roof. "okay - it just might work as a bee house"
Tamara, Tom, and Joe arrived. "aaahhhh..... I don't think I can do this, at least not without a third hand to hold the branch the bees are on to steady as I cut..."
Up she went, we all talked it through, I stood a length below her on the second ladder to help lower the branch once it was cut, and the guys steadied the ladders. Some inbetween stuff happened , but miraculously the branch and the bees came down smoothly, and I have to say, Tamara's balance - standing, not on the top rung, but on the TOP of the 8 foot ladder, reaching overhead and cutting the branch and lowering it with a huge swarm of bees clung to it was truly an amazing feat, and miracle in itself!! We showed them their entrance-way and then closed them up - laying the cedar shingles over the top of the barrel followed by the round disc plywood and some bricks on top to hold it in place. I've read quite a bit about what bees like in homes, and gosh, I don't know, I have a lot of wonder about the barrel, in the condition it is in, but I trust in the bees. Perhaps it will be just a resting place for the night, or perhaps they'll find it quite suitable for their long term needs. I feel blessed once again that they shared the sacred time of the swarm with us, that I was there to witness the energy of their take off from the mother hive (which by the way will continue on with a new queen - which is exciting as well). An exciting event happeed on May 13th, my apologies for the late entries! I went out to the land Sunday, Mother's day to check on things... and what timing indeed! I was going to go in the morning, but since it was rainy, delayed my trip until the afternoon. The bee observatory (a new and unique structure being built for the bees on the land) looks super cool, yet needs some work, before it is ready. I checked on the bees down the lane, and boy, although I didn't actually look inside, the hive energy seem swollen - full, ready to pop, but I was trying to stay optimistic that they'd wait until we had the home ready. I went back to the new structure and was taking some measurements for things that were needed. loud hum ... inside I sensed what was happening... I could feel the vibration of the bees in my body as I walked back down the lane. The hum got louder and louder until there I was, standing in a huge, and most beautiful cloud of bees - stretching out 40 feet or more around me. Hard to imagine all those bees were inside the small hive. There was a bit of wistfulness - that I did not have a home prepared for them, but that soon dissipated in the amazing beauty of the swarm - another birth, a miracle to witness. 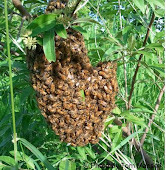 The swarm started to gather in a small maple tree near by - about 30 feet from the home hive. May you find a good home! This past weekend I took the bees some more tea. The last time I left them a quart was about 2-3 weeks ago when there was a warm spell - in the 70s! But then it got cold again, 30s at night and 50s during the day. Yesterday it warmed up again to low 60s. There was a lot of activity at the entrance. I had re-installed the entrance reducer when it got cold, but now warm enough to take it out again, and perhaps now it can stay out. It is still cold at night (30s), but there seems to be plenty of bees (maybe tripled in number since our last visit) to keep everyone warm. It was fun to open the observation window this time and see many bees covering the combs. However, after a few minutes they became increasingly interested in coming out the gap that had been created by the wood shrinking - warping the plexiglas window. This hadn’t been a problem since the fall when it got cold enough that they remained huddled together within the combs. But now things seem to be in full gear. There are also enough of them to leave other jobs and attend to hive disturbances – in this case perhaps a sudden draft coming through the window gap, along with pouring daylight into their quarters. I trusted that a solution would be found when it came time to put the door back on – with all those bees now on the outside of the glass – its challenging to try to sweep them away and get the door on without squishing anyone. But for the time I decided to turn my attention to replenishing their jar of bee tea inside the hive. I started to pry off the first of 4-5 top bars, so I could reach in and replace the empty bee tea jar inside. A tiny gap formed where I was trying to pry off the top bar (the bees “glue” them down each time with propolis, so a special tool is needed to pry the top bars loose from the sides). Many bees, one-after-the-other started coming out the tiny gap under the one end of the top bar. Before I knew it, there were quite a number of bees buzzing around the half opened and exposed hive. At this point I started to feel really nervous. I wasn’t used to this many bees! Two Sanctuary volunteers, Janice and Joanna, were standing by to watch. We thought Joanna could get some photos once I opened the hive and you could see the combs inside. I couldn't go in though. I didn't know what to do. I felt way too nervous with all the bees. I knew this day was going to come at some point – when the colony got bigger – what would I do? Would I still feel just as “easy” with a large number of bees as I have with the small group we had up until now? Janice and Joanna left me to be alone with the bees for awhile. After I was stung in January (see January blog for that experience) I did become a little more nervous around them. That was lessening somewhat, but I told myself if all I could ever do was sit with them, then that was what I would do – for as long as it took – until I did not feel the fear. After all I cannot possibly reach into a bee hive feeling fear! *I cant leave them like this – I didn’t even know if I could get the observation door back on at that point because there were so many bees on the outside of the glass – it seemed impossible to be able to brush them all off and get the door back on. *I couldn’t put the roof back on either because the one top bar was still pried open and bees kept pouring out – Id squish one for sure – and then they’d really be upset. *I thought about calling another beekeeper for help…Nope, not yet! *Maybe I need to go buy a bee suit, then return? (Oh yes – by the way its just me here, no suit). Okay, I thought to myself, that is a possibility – but not quite right for the moment. I asked the bees how they were doing, and about going into the hive and they “said” basically this: that everything was “fine – go ahead in" and "do what you do”. Someday I will completely trust, and be able to flow with this “voice” that I hear from them. But in that moment I continued to feel nervous - albeit reassured from an outside party that "everything would be fine". I held my hands out into the cloud of bees. I tried to breath and relax. One landed on my hand. Good. Maybe she would help me. I am okay with just one. I turned my hand around and up close to my face so we were eye-to-eye. I told her I was scared – kind of in a complaining-like manner. I didn’t know what to do. She looked at me as if listening, even cocking her tiny head a bit, then turned around and flew off! The feeling was as if she wanted nothing to do with that ridiculousness! It was then that I noticed the cloth on top of the hive – the one that covers all the top bars before the roof gets placed on. I realized I could at least drape that over the opened observation window so there wouldn’t be so much sunlight pouring into their usually dark and quiet home. Maybe that would help calm them down. It did – thank goodness. I then walked to the car, maybe 30 yards away, to get something. I was feeling better with restored confidence around the bees. For good measure though - I took some Bach Flower Rescue Remedy (suggested earlier by either Janice or Joanna). I thought it would help ease some of the aftershock of the intensity I just went through. I came back to the hive feeling even more calm, something shifted. Of course the bees were calmer too, now that their window was at least partially covered. I easily removed 4 more top bars, took some video, then reached in and switched out the jars – no problem. I called Joanna who had gone out to take more photos on the land. She was near by and returned to take some close-up bee pictures now that the hive was opened and everyone was calm. thank you for the photos Joanna! The bee girls pose for Joanna's camera! It was especially fun to see three or more colors of pollen being brought in to the hive. There was a deep orange, yellow, pale yellow, and occasionally even white. This video starts out a little blurry but becomes clear about 30 seconds in... and great views of the colored pollen. Bags Upon Bags of Fresh Groceries! I was near by the sanctuary this afternoon and couldn't resist a short visit with the bees on such an incredibly warm and beautiful day. Below are some clips of what was happening at the hive - and pollen is it! Lots and lots of pollen being brought in - by the legs full! I wish we could see them unload, and pack it into the cells - that would be fun -how do they put away their groceries? Do they fill several cells at a time, or do they all start filling just one cell until it is full before they move to the next? Are there different packers and sealers, or do the individual foragers do their own packing? I remember seeing a beautiful photograph once with different colors of pollen in different cells. In the third video you'll see they drank about 2/3rds of the quart of bee tea that I left for them a few days ago. and I look forward to seeing more soon. Its hard to get the photos of them there due to the reflection in the window. Yesterday it was 60+ degrees in Michigan, the first day in a few weeks that it was warm enough for the bees to be out. I made a whole quart of bee tea for the girls in hopes that they would indeed still be there. I had been quite concerned about their seemingly small colony size last I had visited them - the day of the sanctuary's first Polar Plunge about three weeks ago. It was a warm day for February, sunny, yet crisp - not warm enough for the bees to be out, but okay it seemed to open the hive for feeding. When first going into the back of the hive I saw no one. It really scared me. But then I put my ear down into the hive and heard them humming away deep inside the upper part of the combs. I breathed a sigh of relief, left them the fresh jar of tea and closed them up quickly so not to chill them any more. Over the next few weeks it felt too cold to open the hive. Id visit them, place my hands on the sides of their home and send whatever prayers, or energy I could for warmth and plenty of food stores. I tried to calm my fears over seeing no bees in the lower parts of the comb. But I kept wondering how many could possibly be huddled up inside the combs where I couldn't see them? 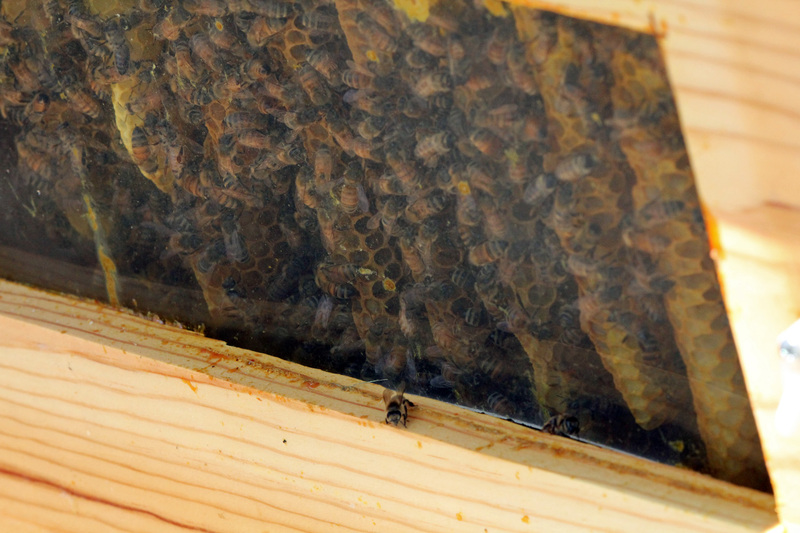 From what I could see on the edges of the combs, there was no stored honey and no brood. Of course you may not expect to find so much on the edges in the deep of winter, but no signs of anything, even a few inches in, left me a bit worried. Now, if I had been inspecting each comb by pulling them out from the very start I probably would have known a lot more about the strength of the colony going into winter, but as I have shared I never did that step for a combination of reasons.. I wasn't ready, it felt too invasive, and I have been savoring all that I have been learning up to and including now. Maybe I'll start inspecting individual combs on my next hive? Or maybe I'll continue to observe from the edges, leaving them their inside privacy? Anyway as I walked up to the hive today I burst into tears to see the girls alive and seemingly well, buzzing about their entrance way. A huge relief! On the cold days when I would visit the hive and put my hands on it to send them warming energy they kept "telling me" - as much as I can read invisible, non-verbal bee signals, that "they were okay", but I worried myself silly just the same. This is one of the many things they continue to help me with - to trust my instincts - that deep inner feeling and wisdom. I sat down and took it all in once again - one of my most favorite spots. Look! Some were even coming into the hive with pollen!! A very light yellow, almost white pollen. That was super cool to see. I later asked Lana, our Conservation Steward at the land what might be in bloom this early and she said the maples were coming out, and maybe some birch! I'm so happy they have fresh pollen to gather for the new springtime babies! Besides the pollen gatherers, others were busy housekeeping - bringing winter debris out to the edge of the hive to give it a heave-ho. I took the entrance reducer out to give them more room to work. They seemed happy with that. I left it out at their request, but will have to go back tomorrow to replace it as its getting chilly again. The content for this blog began forming in June of 2011. It wasn't until September that I was able to catch up and start entering posts from the past four months. If this is your first time visiting, I suggest going back and reading the story from the start under September and October 2011 Blog Archives. At the very least check out the "Build it and They Will Come" entry to see the beautiful birthing of this colony! If you enjoy this site, please consider supporting the bees at Grass Lake Sanctuary by making a donation, in any amount. Visit http://grasslakesanctuary.org and click on the Donate button. Thank you ! and feel free to post questions or comments.